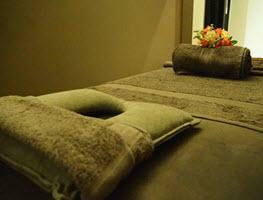 Now considered the premier Thai relaxation massage centre in Crows Nest, Velvet 401 Relaxation Massage brings a new style and standard to the lower north shore. With 4 spacious and elegantly styled massage rooms there is generally no need for an appointment. Conveniently located on the highway, drop by between appointments or after work to relieve the day's stress. Velvet Relax massage qualifies for the Asian Massage Sydney 'Upmarket' class! Open to 9pm. Directions: Towards the city from the 5-ways intersection. foot reflexology, full body oil massage and stress relief. Parking: Parking available at the door and along the Pacific Highway towards North Sydney. The council car park is now open above Woolies. Public Transport: City / Chatswood bus virtually at door. Premises: Brand new fitout in late 2013. Spacious treatment rooms, very modern & fastidiously clean. Shower & bathroom facilities available. Air-conditioned for comfort. Looking for best in Thai style relaxation & therapeutic massage in Crows Nest, St Leonards, North Sydney, Willoughby, Cammeray or Wollstonecraft? Call (02) 9460 6058 Now!